After a 48 hour whirlwind travel experience, I’m finally settled in to my villa in paradise – otherwise known as the Four Seasons in Mauritius. While I have already mentioned in this space that I will be writing about my amazing travels across the world, this story is about how the trip almost never happened. It may not be for the faint of heart, but as I sit here in the luxury of a tropical destination, I feel I can already look back at what happened and breathe a sigh of relief. It all started innocently enough. Wedding reception on Saturday (blogged about here), travel plans beginning with a 7 AM flight on Monday morning, and then after 45 hours of travel, arrival in Mauritius. While I wasn’t looking forward to the time of the travel, we were able to secure business class seats for most flights, so at least we could get some sleep on the plane. The least of my worries was the first day of travel, which featured a seemingly routine flight from MSP to Washington Dulles Airport, with a ~7 hour layover before our next flight to Paris. In fact, it was so routine that I made a list of tasks I wanted to accomplish while sitting in the Air France ‘Salon’ for that entire time. A mix of personal and professional tasks would keep me busy that entire time, no doubt. After checking in to the Air France Lounge, the attendant asked us to have a seat while she looked made sure everything was in line with our tickets. While seated in the lounge, I was looking up information about things to do in Mauritius, trying to change our train tickets from Munich to Paris later in the trip, etc. Basically tying up last minute details. At any given time, I have between 5-25 tabs open in my Google Chrome browser, toggling between information, keeping track of items I want to discover, and more. 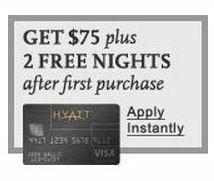 One of the tabs I had open from early March through mid July was an offer for a $75 statement credit (waives the annual fee for 1 year) when signing up for the Hyatt Visa Signature card, which is one of the better cards available for hotel programs. Unfortunately, I was not able to apply for the credit card in time before the offer expired, and I thought I had missed out on the opportunity. I was disappointed, because I wanted this card in particular for the European portion of my upcoming trip, because it has a Micro-chip on the card, which is very important for European travel. I learned this the hard way when I was in Prague in December and most merchants were hesitant to take my credit card without a microchip. Fortunately, I saw a post from Gary last week that announced the $75 credit offer was available again. All you have to do is visit the Hyatt website, start a reservation and you will be met with a targeted credit card offer. These are some amazing perks for essentially paying $0 to get started. There doesn’t even appear to be a minimum spend required to get this deal. So basically, you can get 2 free nights and platinum status for free. That’s a good deal friends. Needless to say, I bit the bullet and signed up for the card on Sunday. They didn’t tell me I was approved right away, so I was afraid I wouldn’t get the card at all or at least not in time for my upcoming trip. Boy was I wrong. The card was waiting for me when I got home on Tuesday – beautifully packaged in an overnight envelope. The packaging was beautiful, and the card fits nicely in my wallet. It’s almost as elegant as my Chase Sapphire Preferred card, but without the nice weight. What an incredible experience signing up with this card. Chase and Hyatt have created a fantastic program.